So what is Business Intelligence (BI) and why do you need it in your business? Why is Business Intelligence is so important? Most companies track and record thousands of transactions daily. Not just customer purchases – which might include information such as the customer, the products/items sold, the store from which the purchase was made, and the date and time of the purchase – but also transactions such as warehouse activity, inventory purchases, employee hours and time off, and daily operating costs. Zoho Reports is a small business intelligent app that helps to process key financial and non-financial data for decision making purposes. By integrating with Xero, it easily analyzes the financial data from your Xero account. It lets you slice and dice your Xero data the way you like, and create reports and dashboards to derive exactly the information you want. It helps you analyze your invoices, create P&L reports, track your overall accounting performance, and do much more. 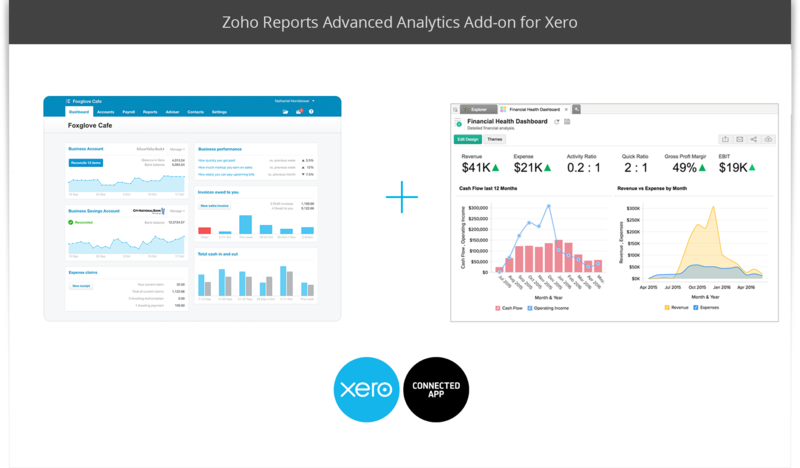 Zoho Reports advanced analytics add-on for Xero enables you to slice and dice your financial data and derive great insights. You can analyze and create reports such as financial overview, bill trend, pending invoices and do much more with Zoho Reports. You can also combine the data from Xero with the data from other sources/services and do cross functional analytics. Once you gain an understanding of what Zoho Reports can do for your business and how it can relate and support your business processes, you can then create meaningful, actionable reports and dashboards to assist your staff in focusing on achieveing the company’s goals and objectives. Here’s an example below of Xero Advanced Analytics in action. Want to create and utilize insightful business reports and dashboards to make informed decisions? Contact us to find out more or discuss your requirements.